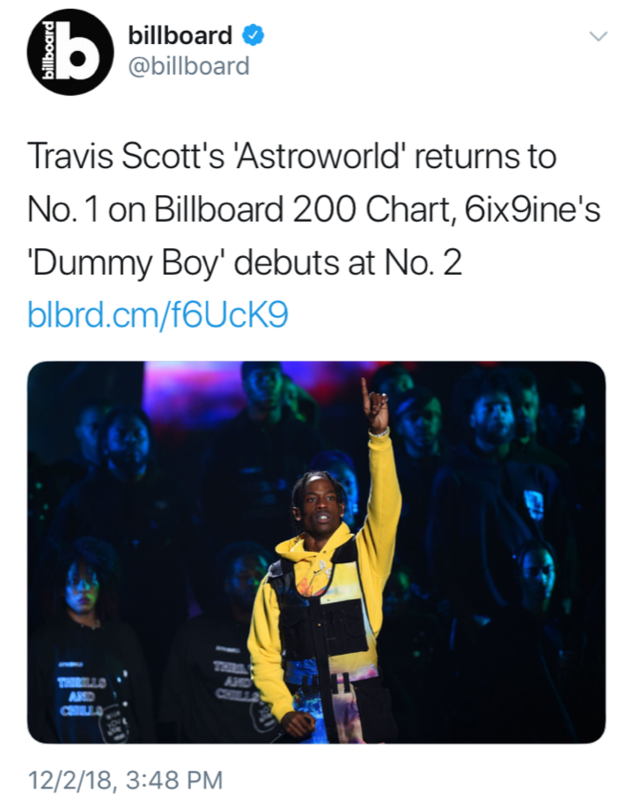 That seems to be the industry-wide refrain in response to the latest Billboard chart flap, as the Bible’s prior anointing of Travis Scott as #1 on its Top 200 after a squeaker of a race with 6ix9ine will now be re-run and may be reversed after a challenge. An email in response to the initial challenge from Drew Bennett at Nielsen reads, "Our team has done a deep dive and found the cause of the initial discrepancy. We've since then reprocessed the jobs necessary and re-finalized the charts. As a result, 6ix9ine's "Dummy Boy" will be moving to #1... Our team is working quickly to identify the root cause of this discrepancy to ensure that we get it right the first time." This after the Bible launched an eblast as well as a tweet (since deleted) crowning Travis that was picked up around the world—with a custom tiny URL link that read “f6UcK9" (which still works as of this writing). Sony is mounting its own challenge. It’s pretty clear that nobody in the Bible’s chart brain trust had a clue who was #1 and who was #2—although “number two” certainly describes what they’ve stepped in. And what about that custom URL? Even if it was randomly generated and not intended as a slight to the artist, why did none of their resident geniuses catch it? Either way, an explanation is in order. It would seem the inmates are running the Bible's asylum, although biz observers expect a new set of inmates—as part of yet another changing of the guard—probably before year’s end. Will some of the visionaries who presided over this mess be the next to oversee the once-august publication’s editorial? Failing upward, after all, is the essence of the Amato Doctrine, which appears to remain very much in force in Bible Land even after the departure of its namesake. Stay tuned.